Palava: An Innovative Answer to India’s Urbanisation Conundrum. How are cities going to address the growing desire to listen and engage with their residents? India is expected to undergo one of the largest urbanizations ever by 2030, with its urban population growing from 350 million in 2015 (30% of total) to 600 million (38% of total). Imagine adding almost the total population of Europe to India’s urban population over ten years-this is what India faces! The extraordinary scale and pace of this transition is already placing an enormous burden on cities, and this reflects in their struggle to deliver even the most basic services to their citizens. Housing deficit, poor quality of city planning, vehicular population, rising pollution, poor quality of living and weak governance are challenges to be addressed. As of now, the list of unfinished and unattended items on the urbanisation agenda is long and daunting. Going forward, whether these new cities become chaotic slums – or become truly sustainable, would depend on how city developers plan and respond to the urbanization challenge. The solution lies in how cities are planned, governed, and provide services to their citizens. Increasingly, experts are reiterating the need of a new model of urbanization that not only strives to improve liveability but also helps plan and build new future cities. Palava is fast emerging as a case study for a sustainable model for urbanization in emerging economies. In a very short duration since its inception, Palava has become home to 100,000 + population, which is further expected to grow to 500,000 by 2025.Instead of imitating established models, Palava has innovated on how it wants to deal with urbanisation. The city has been designed to accept that infrastructure at this scale of urbanisation can never be sufficient, a high quality life and opportunity can be achieved for every citizen and city governance needs to be sustainable in long term. Can we build a city where one doesn’t need a private vehicle? Emerging cities with huge urbanization pressure cannot build sufficient infrastructure to keep up with enormous escalating demand. The move to driverless vehicles or electronic vehicles is great but it does not address the core issue of insufficient infrastructure. A radically different thought in designing cities is thus needed- this is where Palava, designed as the world’s first walking city, steps into the picture. Palava is the world’s first “green mobility city” with wide footpaths, cycling lanes and e-scooters that save fossil fuels and reduce the carbon footprint. Intelligent city design places everything you need- workplaces, schools, and parks-at just a 5 to 15 minute walk away, saving community costs, minimizing travel time, and improving citizens’ quality of life. 25% green spaces and 60% open spaces enable Palava to maintain the best Air Quality Index of 60-70 in MMR. Can we create responsible citizens to own and govern their own city? Professionally run by Palava City Management Association (PCMA), Palava delivers an international standard of governance and public infrastructure at highly competitive costs. Resident councils have been formed where resident experts work closely with PCMA on day to day decision making for the city. All city information including financials are disclosed regularly for residents to evaluate and comment on. Palava’s technology infrastructure has played a key role in governance too and has provided multiple convenient platforms for residents and PCMA to interact with each other. Residents often use social media platforms, Palava’s dedicated app/portal to access information on day to day happenings in the city, access important documents and reach out to PCMA. PCMA also plays an active role in managing activities to allow residents to interact with each other and foster a sense of community in the city. Cultural events, activity groups and Sports tournaments ensure that residents are party to a vibrant lifestyle all around the year. 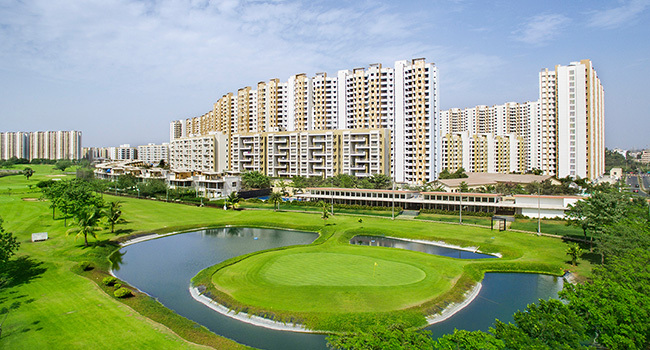 Palava has a FIFA standard football stadium, full-fledged cricket ground, 9-hole golf course and multiple cluster clubhouses with sports facilities like swimming pool, table tennis, badminton, tennis etc. An Olympic sports arena is being constructed that would be fully operational in the next two years. Palava is well on its way to become a model of innovation for urbanization. It’s getting recognition globally but more importantly, in a short span of 8 years, it has been able to create a vibrant sustainable eco-system, for its thriving community, which focuses on a big city’s aspirational appeal but also addresses its limitations. Innovative solutions delivered in Palava have been very successful and need to become the way ahead for all city planners still struggling with addressing the urbanization challenge.